While the NBA is a forward thinking multi-billion dollar industry, it is fair to say that some of the people involved in the industry are not as progressive as others would like. The racist comments from Donal Sterling are still too fresh for many people who love the game and of course, there has been a litany of incidents and statements involving NBA players that have failed to show the game in the best possible light. This isn’t something solely attributed to basketball and the NBA, all of the top sports have issues and things that they are not proud of, so it is good to see a team making a bold step forward. As the San Antonio Spurs are the current NBA champions, you would think that things are going pretty well for the club and they would be looking to maintain things as they are this season. This is why the announcement of a new assistant coach may be of surprise, but when the new coach is a woman, there has been a great deal of surprise at the announcement. The club has stated that they are hiring Becky Hammon, a soon to be retiring superstar from the WNBA. Head coach of the Spurs, Gregg Popovich, has already spoken to the media about the addition of Hammon to his coaching team. He states that he believes Hammon’s interpersonal skills, her work ethic and her general understanding of basketball will be of considerable benefit to the team. Hammon has already worked closely with Spurs during the last campaign, a campaign which ultimately ended in triumph for the San Antonio team. It was only last month that Hammon announced she would be retiring as a player this season. 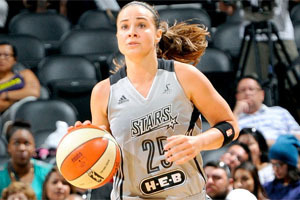 Hammon has been on the WNBA All-Star team six times and she has spent her past 8 years with the Silver Stars in San Antonio. There is no doubt that Hammon is a great talent and she is the leading player with respect to assists, 1112, and three-pointers in the Stars team. She is also the fourth listed player in the history of the franchise with respect to games, 218, and in the points tally, 3422. Hammon received most points in the vote to determine the Stars team of the decade. The appointment of Hammon sees her become the first ever female assistance coach in the NBA, which is a great move on for the league. There have been some females employed at courtside in technical duties in the NBA, but the two highest profile cases have been relating to video co-ordinator positions. There will undoubtedly be some fans bemoaning about the appointment of Hammon in such a role, and you can bet that there will be some former professionals bemoaning the fact that they cannot get the position. There is no doubt that the all-male preserve is coming to a close and if a club thinks a female is the best person for the job, it makes sense for them to make their employment decision on this criteria alone.